The flu and common cold always leave you feeling under the weather, but being pregnant adds another dimension. How can you treat your flu or cold when you are expecting a baby, and what can you do to avoid becoming ill in the first place? The changes your immune system undergoes while you're pregnant may make it more likely you get sick — with a cold or flu, for instance. Though these two viral infections are often lumped together, perhaps because they share some symptoms, they're actually quite different in nature. How do you tell the cold and flu apart, what can you do to prevent them, what do you need to do to look after yourself if you're both pregnant and ill with either, and when is it time to call a doctor? The common cold vs influenza: How can you tell them apart? We've all been "just plain, generic, sick" with some bug or another, taken self-care steps or just given it time, and not really cared about what exactly we were afflicted with. During pregnancy, anything that happens to you can also affect your baby, however — and you probably find it more important to know exactly what is going on. You may not have been aware that some adults run a fever when they've caught a common cold, something that's more likely in people with weaker immune systems — such as during pregnancy. Because most adults catch two to four colds every year, you're pretty likely to experience at least one while you're expecting a baby. 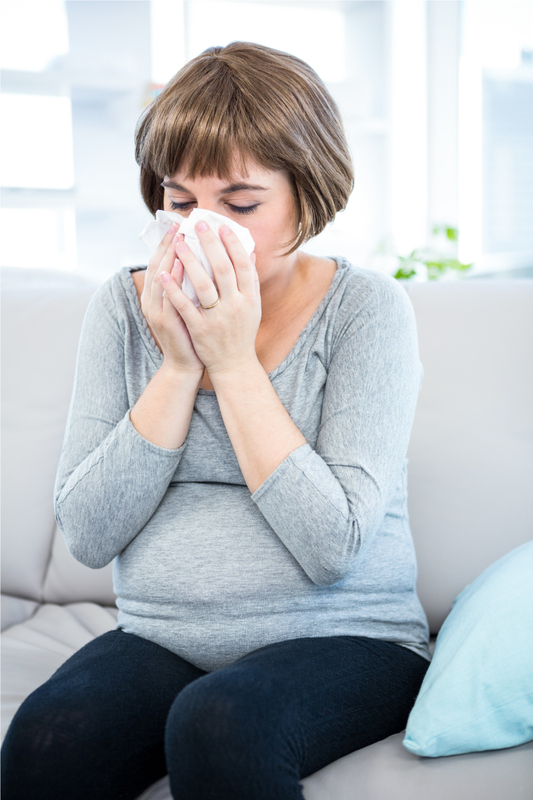 What can you do to prevent a cold or flu during pregnancy? Practice proper hand hygiene — beyond "after the toilet" and "before eating", it's also important to wash your hands after contact with people (handshakes, for instance) and public surfaces that may have been touched by sick people (doorknobs, elevator buttons, keyboards, stair ralings, and so on). Do not touch your face — including rubbing your eyes or nose, or touching your mouth — without first washing your hands. Avoid contact with sick people in public, and ask people who know they're sick with a flu or cold to stay well away from you. Periodically wipe surfaces in your home, workplace, or other spaces where you may spend time (like a hotel room) down with antibacterial wipes, as viruses can survive on these surfaces for a while. Before getting pregnant, you may have made the choice to just ride a suspected flu out without seeking medical attention — and that's usually fine. Pregnant women with the flu are much more likely to need to be hospitalized, however, and the fever you often get when you have influenza has even been linked to birth defects. You will, as such, strongly want to consider accessing antiviral medications. Available from your doctor, these antivirals reduce your symptoms and the duration of your flu — but they work best if you get them within 48 of the start of your symptoms. Oral oseltamivir is the recommended antiviral for pregnant women with the flu. You may worry that painkillers and fever reducers aren't safe during pregnancy, but because the fever itself can pose a danger to your baby, the CDC recommends that you take Tylenol (paracetamol, acetaminophen) to bring your temperature down to normal levels. You are advised to avoid taking non-steroidal anti-inflammatory medications such as ibuprofen and naproxen during pregnancy, meanwhile, unless a doctor recommends it to you. Call your doctor immediately or go to the ER if your fever isn't coming down even after you've taken Tylenol, you are confused, you have trouble breathing, you're vomiting heavily, you experience abdominal or chest pain, or your baby stops moving or moves less often.